After selecting the file or receiving it from some external application Locus Map analyses it and modifies the import dialog according to the content - the dialog can process tracks or points or both of them at once. Folder selector - selects the folder into which the file will be imported. 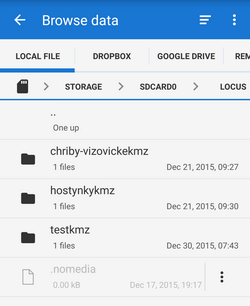 It is possible to create a new folder directly from the menu - select Add new folder. If you started import from a folder action menu in Data manager it is already pre-selected. Bottombar - contains Cancel button aborting whole operation and Import button to confirm and start importing. When importing track and detached waypoints in one imported file Locus Map offers connecting the waypoints to the track so that they are stored in the same database and displayed on the map together. Otherwise the points are stored in the points database and can be managed and displayed separately. Keyhole Markup Language is XML based plain text format with really wide range of usage. Since the version 2.2 KML format is standardized by OGC so it is used by many web/desktop/mobile applications as well as Locus Map. GPS eXchange format is an XML based text format used for handling points, tracks and routes. Locus fully supports all valid tags. More detailed description of GPX format is available on this Wikipedia page. Training Center XML is a data exchange format introduced as part of Garmin's Training Center product. The XML is similar to GPX since it exchanges GPS tracks, but treats a track as an Activity rather than simply a series of GPS points. TCX provides standards for transferring heart rate, running cadence, bicycle cadence, calories in the detailed track. It also provides summary data in the form of laps. Sets default color of all recorded, imported or manually created tracks. 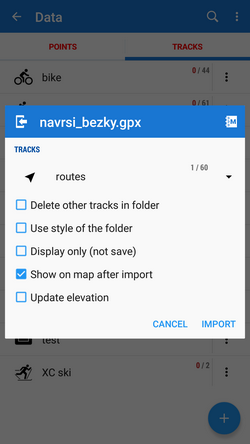 Sets default width of all recorded and imported tracks and manually created routes.